Edgar Mitchell, who was the sixth man to walk on the Moon, has died at the age of 85. The astronaut passed away at a hospice in West Palm Beach, Florida, one day before the 45th anniversary of his Moon landing, his family said. As part of the Apollo 14 mission in 1971, Edgar Mitchell spent more than nine hours on the Moon conducting experiments. He said he had undergone an epiphany in space and in later life revealed a belief that aliens had visited Earth. Edgar Mitchell’s mission to the Moon was the fourth in the US Apollo series, and the first to follow the ill-fated Apollo 13 which aborted its attempt to land after an oxygen tank explosion. The astronaut and his crewmate, another Navy officer, Captain Alan Shepard, made it safely to the lunar surface. Their landing site was the Fra Mauro Highlands, a hilly area that was the target of the failed Apollo 13 mission. During their 33 hours at the site, the two astronauts collected 94lb of Moonrock for examination back on earth and completed the longest moonwalk in history. Capt. Alan Shepard also hit a golf ball he had stowed onboard for the purpose, reporting later that it traveled “miles and miles and miles” in the low lunar gravity. He later estimated it traveled up to 400 yards – still considerably further than his average Earthbound drive. Edgar Mitchell brought home more than just Moonrock, telling reporters in the days after the mission that he said he had experienced an “epiphany” in space and returned with “an overwhelming sense of oneness, of connectedness”. Edgar Mitchell left NASA in 1972 and set up the Institute of Noetic Sciences, which aimed to support “individual and collective transformation through consciousness research”. 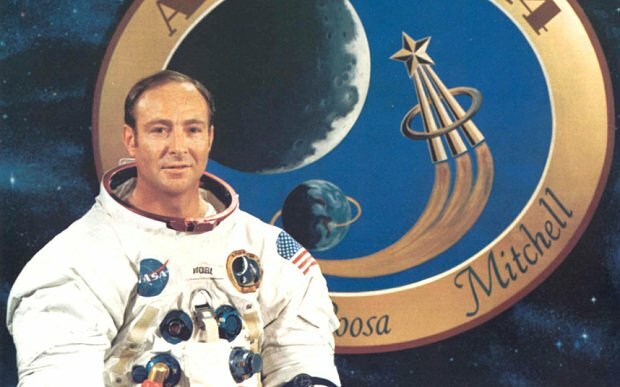 Unlike his post-NASA life, Edgar Mitchell took a very traditional route to becoming an astronaut. He flew fighter jets for the Navy before becoming a test pilot – a profession from which many of the early Apollo crews were drawn. He joined the astronaut corps in April 1966, five years before he went into space. Apollo 14 was his only spaceflight. Of the 12 men who have set foot on the Moon, seven are still alive following Edgar Mitchell’s death, including Buzz Aldrin, Neil Armstrong’s crewmate on the first mission in 1969.